Typically a zoning will be stated within any commercial real estate listing for sale or lease. The agent representing the property can provide prospective tenants with the uses allowed within the zoning however a prudent Tenant should do their own research. On our standard offer to lease we, as a brokerage, ask that tenants verify their use is allowable in the zoning where they have chosen a location within the municipality themselves. Most municipal offices make their zoning bylaws available to the public via hard copies at their office and on their websites. The City of Saskatoon, for example, has a fully downloadable PDF version of the zoning bylaw in addition to zoning maps which show the specific zoning for all civic property. These are tools I utilize almost every day in my job. Legal issues can arise if, as a tenant, you have a signed off on a lease but your use is prohibited in that particular zoning. Re-zoning from the City is not only complicated and lengthy, it’s also very rare. Unfortunately, if you have signed off that you have checked the zoning during the standard offer process, you are now you are on the hook for your obligations to the landlord under the lease. Use is not the only place that zoning can trip up potential tenancies. There are many requirements under the zoning bylaw that a tenant must meet to be compliant with the City. Parking is a topic that often comes up. The City may allow your use in a specific however there may be a minimum amount of dedicated parking stalls for your customers or employees that cannot be met. This issue just came up for me with a potential restaurant user who insisted they didn’t need a lot of parking. It’s not the landlord’s responsibility to determine the number of parking stalls needed. The City will have specific numbers per your amount of square footage and general use that they require. Zoning can have a major impact on property value from an investment perspective. The wider the allowable uses, theoretically the better the value. 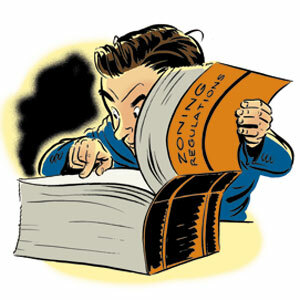 Most municipal zoning bylaws break down their zoning districts into the following information: purpose of zoning, permitted uses, discretionary uses and prohibited uses. They will indicate where to find information about construction restraints, landscaping requirements, parking and signage based on each use. Again, using the City of Saskatoon for example, the commercial zoning known as B1 through to B6 can shift widely between uses. The description of the zoning can be an early indicator. B1A is listed as a Limited Neighbourhood District. The purpose of this type of zoning is for businesses to act as the daily convenience providers to surrounding residential occupants. Permitted uses for this zoning is limited to 11 specific types of business and only two discretionary types. If you’re shopping for an investment with potential to redevelop, the zoning is imperative to your final decision. You can’t construct anything on a B1A site outside of those businesses. In both instances, zoning is significant factor to consider. Like other areas of due diligence, it’s a piece of the puzzle you must investigate before signing off on any real estate deal. Have you heard of any zoning horror stories?